With its almost-Porsche-like looks, this Patriarca 750 Berlina is one of many specials built on the backs of small Fiat road cars. Post War Italy didn’t have an economy to support a lot of fancy car sales, so companies like Fiat focused on small, affordable cars for the masses. But that doesn’t mean Italians still didn’t love motorsport. So people like Rodolfo Patriarca and Carlo Abarth took to modifying these cars for sport. This car was based on a Fiat 500C and has an 81 horsepower, 750cc straight-four tuned for racing by Giannini. It continued to race through 1953, with at least one more appearance at the Mille Miglia. It’s wonderfully restored and eligible for many historic events. You can read more here and see more from RM here. 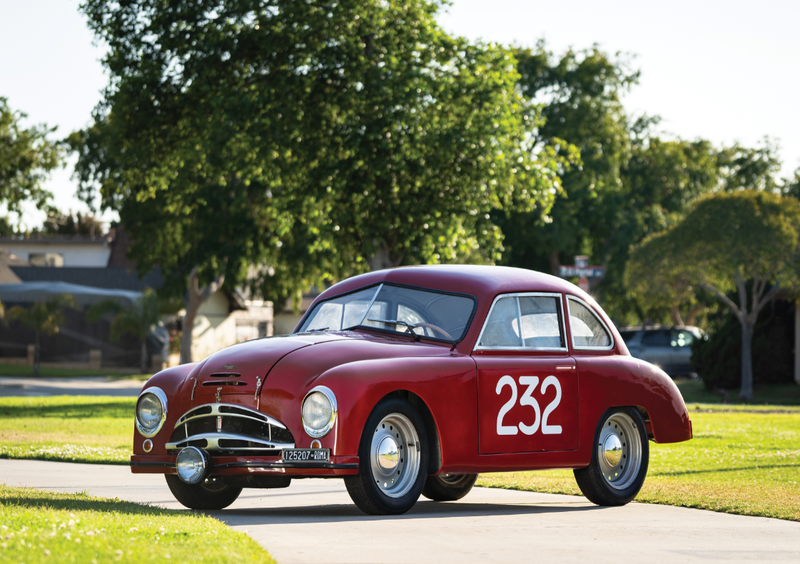 This entry was posted in Uncategorized and tagged 1949, 750, auctions, berlina, cars, classic cars, faina, fiat, patriarca, race cars, rm sothebys, sport by classiccarweekly. Bookmark the permalink.